After the recent news of attempts to use legislation to force owners of derelict property to sell it, there is news of an initiative intended to rejuvenate vacant and derelict land. I wonder if there is any connection or relation between those behind these efforts, and the coincidental timing of their appearance? A task force to develop some of Scotland’s 12,000 hectares of vacant and derelict land is being launched. A register of disused property was set up 30 years ago but the total area – around twice the size of Dundee – has barely changed since. The target of the task force is to halve the amount of land on the register by 2025. The group – set up by the Scottish Land Commission and the Scottish Environment Protection Agency (Sepa) – will examine the impact on vacant land of planning policy and legislation. It will also look at practical ways for the land to be utilised. As with the preceding housing initiative, while I don’t want to be misinterpreted as being in some way opposed to the idea, I do have similar concerns. If those houses, and now this land, is such ‘hot property’, why haven’t the existing owners cashed in, and made some money, instead of (probably) losing money by leaving their supposed gold mines undeveloped? I speak from sad experience, having inherited a small house, ended up paying various charges/bills/taxes associated with it, and then had to sell at a loss to get rid of it and its associated liabilities. While every case is different, I can’t help but wonder at the wisdom of effectively ‘forcing’ sales and development of land and property (which has not inspired such a thing on its own), and how long such forced projects will survive once the novelty has worn off, and they have to survive on their own merits. It would be interesting to see, after say 10 year or so perhaps, how many of the projects arising from this sort of legislation are still in place and economic, and how many have not been sustainable, and reverted to back to vacancy or dereliction. Coincidentally, there were two stories seen in the news along with the above, one related to possible success, and the the other to failure. In the first, refurbishment of an abandoned dry dock has led to positive proposals. New steel could be made from metal recycled from decommissioned offshore oil and gas structures under a plan for one of Europe’s largest dry docks. Liberty Steel, part of a group that owns the Fort William aluminium smelter, has proposed constructing an arc furnace for the work at Kishorn. The dry dock in the west Highlands was established in the 1970s. It has now been refurbished and made available for new work, including recycling offshore infrastructure. But in the second, dry docks that have lain abandoned and decaying for some thirty years, with no development (although housing seems to be probably), and not attracted any serious commercial development. Senior politicians from three parties have backed calls for a new industrial strategy to help “save” former ship repair sites on the Clyde. A letter to First Minister Nicola Sturgeon says the Inchgreen dry dock in Greenock and Govan Graving Docks have needlessly been allowed to decay. Campaigners want an action plan to stop marine industry sites being lost to housing or retail development. The owners of both sites have insisted they have plans for their future. The STUC along with 23 MPs and MSPs from the SNP, Labour and the Greens have endorsed a joint letter to the first minister from the Campaign to Save Inchgreen Dry Dock and the Clyde Docks Preservation Initiative. While the first story about Kishorn looks hopeful, being based on an actual proposal for commercial use, sadly, the second seems to be little more than hot air from those with political motives, and claims that amount to ‘Conspiracy Theories’. I worked in some of those docks, and it’s always been depressing to see that nobody came up with a practical and economic use for them years ago, before they decayed. If they were so good, why didn’t one, or more, of the successful overseas shipbuilders snap them up years ago, when they could probably have been acquired for ‘Fire Sale’ prices? These docks are outside my range, but I found a great night pic, taken in 2008, from Thomas Nugent’s collection. I once thought it would be a nice idea to catch views of some the old surviving buildings in Glasgow. That was so long ago, cameras only had film in them, and the electronic bits only controlled the exposure. But even that far back, I gave the idea up after only two weeks (or weekends to be accurate) since it quickly became obvious, even then, that most of the crusty, wrinkly, old buildings were long gone, leaving (mostly) those that had survived with some sort of use, or those that were abandoned, derelict, and featureless. Utilitarian types with nothing to distinguish one from another. The type where a pic of one is a pic of all. It’s still possible to find a few surprises, such as this fragment I spotted by chance in Oswald Street. There’s a nice sandstone building to its left – but much of the rest is gone now, with new builds having taken most of the street over in recent years. This is close to being a gap site. It shows another ‘feature’ I once thought of wandering around the city and collection from old buildings, but I was too late for that one too, most having weathered to the extent that they were almost invisible to the camera, even if the eye could still make them out. Almost gone, this is only visible evidence of the once common signs painted on many of these buildings in their day. I looked at the rest of the façade, but the decayed surface had lost any details that might once have been visible. The shop unit on the right hasn’t seen a decent/real occupant for years, and remains unoccupied. I suspect if the two remaining units ever go, this would soon become a proper ‘gap site’ which would be easier to sell. Glasgow (and even Scotland) has a dismal record regarding the preservation and maintenance of the few historic glasshouses (or winter gardens) in its care. Examples such as Springburn Winter Gardens have long lain in ruins, and although I can’t get there now, was sad to learn that the glasshouse in Ayr’s Bellisle Park had been closed in 2005, and I saw the sad sight of it boarded up, but thanks to local efforts had been restored and reopened in 2016. Surely the worst case (since it was rescued but then dumped only a few years later) now has to be Tollcross Winter Gardens (not forgetting its once new Visitor Centre). 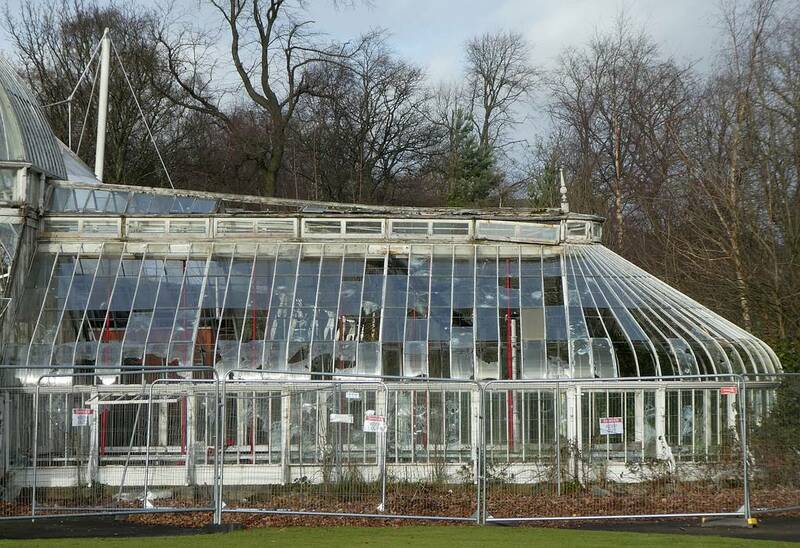 In summary, the Winter Garden glasshouse in Tollcross Park was last rescued and refurbished in the period 1999/2000, having then lain derelict for at least a decade, and at risk of being lost at worst, or left to be vandalised or rot at best. However, £1.7 million was raised to save it then, when it also gained an adjacent Visitor Centre, café, and play area. But, having suffered storm damage during the winter of 2010/2011, it was simply closed and left to rot, with lack of cash being given as the reason. While Glasgow City Council squandered more than £300 million paying to host the farcical 2014 Commonwealth Games, and spent freely on ‘upgrades’ for the Commonwealth Pool in the sports centre only a few metres from the stricken glasshouse, not a penny could be found to restore what would have been a better tourist attraction – since it would always be there, unlike the ten days or so of sporting madness of the dopey games that were ‘Here today, gone tomorrow’. Since the hull of the clipper ship ‘City of Adelaide’ (aka The Carrick) went there, I get automated news updates, which include articles relating to Adelaide. This story about what would appear to be the only such glasshouse in the southern hemisphere was just highlighted, and puts Adelaide ahead of Glasgow in this particular race. Being a sole survivor of war is a burden few ask for, but when you fall under the weather and weigh 22 tonnes, you can be sure to draw attention. The Palm House in Adelaide’s Botanic Gardens is undergoing its second restoration in about 25 years, with a team of painters and builders treating it for salt damp and rust incursion. Plants have been moved out and cracked glass panes are being replaced, as workers utilise a huge freestanding scaffolding structure that took a week to build inside and around the 1877 structure. Originally built in Bremen, Germany in 1875, the Palm House was shipped to Adelaide and reassembled, although the glass panes were all broken by the time it arrived. Following the devastation of subsequent wars in Europe, it remains the only known German-built glasshouse from the era and is Australia’s second oldest. Andrew Carrick from the Botanic Gardens and State Herbarium said there were similar examples of iron and glass botanical houses around the world, such as the Crystal Palace and the Kew Gardens palm house in London. “They are the same style with the cast iron, and obviously at a much grander scale, but ours is probably the only one in the Southern Hemisphere,” he said. It is also possibly the only surviving example of a prefabricated glasshouse, and was originally used for tropical plants until rust incursion in the early 1990s led the gardens to change its use to dry plants from the southern and western tips of Madagascar. The Adelaide glasshouse scaffolding supporting… restoration. The Tollcross Winter Gardens scaffolding supporting… what’s left. I’ve had these pics for a while, but never seem to find the opportunity (or good reason) to post them, but the odd find should be included. I’d been wandering in Rutherglen for a while, when the rain sent me heading for cover as it turned from just a bit of rain, into a steady downpour that just decided not to let up. I headed into a derelict industrial unit near the road, and found some unexpected goodies left there. Sure, it had very little roof, but even some roof is better than no roof at all when it’s absolutely chucking it down. I don’t get there very often, but I’ve never seen anyone else around here when I have been here (even in much better weather. Hopefully the pics are readable – I haven’t spent any time fettling them, just resized and corrected automatically to make them suit the blog, then dumped the set in here. Recall the recent post regarding the vanishing porch of the McLellan Galleries. Since I didn’t seem to able to dig anything up regarding the fate of this venue online (if you know better, PLEASE add a comment below), I decided to make another detour when nearby. Last time I hadn’t bothered sticking my nose up against the glass doors as they were locked and filthy, but this time I decided to have a closer, just in case I was missing something obvious. From the previous post, there are NO signs anywhere around the entrance, and I can now confirm there is nothing on show just inside the entrance either. Although the place is in darkness, with no lights on, my ‘famed’ handheld low light photography skills extracted a view from the gloom (and this was 20:30 with fading exterior evening light). The sandstone sides of the corridor behind the door can still be seen, with the odd circular detail on each side. The track lighting system installed on the roof of this entrance corridor is also still clearly visible. In the distance, the glass doors to the gallery space can be seen, complete with reflections from the street, even showing the steel mesh of the perimeter fence around the current works in Sauchiehall Street (and some sort of ghoulish figure standing in the doorway). Even some floor detail can be seen. What the heck is that in the upper right of the pic? It looks like a hole in the ceiling, and view through to the roof of the surrounding building. Impossible, and I didn’t notice this at the time. I’m assuming the rational explanation of this merely being a reflection of the building behind the photographer, caught in the gallery’s glass door – which is a fine explanation, were it not for the fact that the lens of the camera was placed against the door, to avoid any reflections. It’s definitely the building behind (from the window design, chimneys, and vegetation – the mystery is just how it came to appear. I suppose this means ANOTHER visit as soon as possible, just to work out what actually caused that roof segment to be captured in the shot. My guess is simply a double set of glass doors – so I was able to avoid any reflections in the outer set, but couldn’t do anything about the inner set. When I was finally able to get as far as Sauchihall Street to get a look at the Mackintosh Building, I wandered near the McLelland Galleries, which are almost inaccessible due to road works in Sauchihall Street, unrelated to the closures resulting from the Mackintosh fire. I thought I was suffering from a touch of ‘brain fade’. Although it’s some time since I had any reason to be near the galleries (since most of the shops that interested me around there have gone), I recalled the galleries had a porch, or portico, extending into the street and providing a sizeable cover to the entrance, as seen in the old pic clip. Although I thought I’d arrived at the right place, the absence of any porch, or even a sign with the words ‘McLellan Galleries’ to be seen, had me thinking I was in the wrong place (not helped by the likes of Jessop’s being long gone). But, I was pretty sure I was in the right place, so started looking at the detail of the building entrance, which were the same, and then I spotted the stubs of the girders that used to support the porch. The fence around the road works meant I couldn’t stand in front of the entrance to get decent pic, but I found I could get a better view by shooting through the fence, from the other side of the street. What was more noticeable one I’d confirmed I was looking at the right building was not the absence of the porch, but the fact that I could not see any signs identifying this as the McLellan Galleries, and the derelict nature of the entrance. A stranger or visitor to Glasgow would not know what they were looking at. Dirty from the works in the street, the place was in darkness. Granted I was there in the evening, but from the limited view through the dirty glass doors, it seemed to be empty inside, with no lights or even security staff to be seen. I took a look online, but could find no recent references to displays or exhibitions held there. Nor was there any recent information about the galleries, such as invitations to hold events or exhibitions there, or even a dedicated web site. Do tell if you know better. Another one I’d class as forgotten and unnoticed over the years. I woke up one day, and realised it was time to grab a pic of this place after passing it for years without realising it. I think the reason I never got around to taking a pic was down to expecting it to disappear before I got back to it. I’m sure I saw the place open, as a pub, but I have no idea what it might have been called during that phase of its existence. I probably didn’t even notice when it slipped into being an abandoned derelict, since I would pass in the day, and a nightclub opens at… night! I just began to notice it was decaying one day, and a number of scummy businesses were using as a placeholder for their scabby adverts. Maybe it’s not abandoned and derelict – I wouldn’t know! I dug around and discovered it was variously named ‘The Jigging’ (or Jiggin’), and The Netherfield Bar (Nerry or Nelly in various forum discussions). In discussion, it seems to have been described as one step up from ‘scary‘, which would appear to be ‘mental‘. The Jiggin. (Netherfield), 1071 Duke Street, Glasgow. G31. I know why old pubs used to manage to survive, standing isolated on their ground while tenements and shops around them were razed, but this, one of the few relics I would describe as a genuine eyesore with nothing to redeem it, one’s survival is a mystery, especially given the reported failure of pubs these days, as many choose to drink at home, rather than socially. It’s hardly sitting in the middle of a thriving community, and the proximity of a college (Glasgow Kelvin College) is unlikely to see it reopen soon. I’ve got my pic, they can take it away now. Maybe I’ll get a pic of the cleared site one day, or, being Glasgow, the burnt out shell. I’m surprised the latter has not appeared sooner. A post I made about the police headquarters building in Calton reminded me I had grabbed another such building, in the city’s St Andrew’s Square (apparently still classed as Calton according to its address). Dated to only 1 year earlier than the first, 1903, the St Andrew’s building is described as an irregular plan building containing offices, court hall, cells, recreation, and reception areas, all built around a courtyard and built to conform to an awkward site. There would have been stables too. Back in 2004 it was noted to be home to a police museum, but this moved to an alternate location a few years later, leaving the building abandoned and derelict since. It has been decaying since then, but was sold in 2016. There don’t seem to be any immediate plans for the building or its site, but pre-application discussions have been reported between the new owner and architects. Oddly, there doesn’t seem to be any (easily) found recent history online regarding its closure. This isn’t a particularly recent pic, but there’s still a fair amount of vegetation showing. If it’s not cleared, the roots can do considerable damage if left unchecked. Recently passed this building and noted the entrance was barred only by wrought-iron gates, meaning the courtyard was visible. Generally occupied by rubbish, the courtyard was originally bordered by stables, latterly used as garages. The wall above still has the barred windows of the cells in place. It really is sad that it’s possible to walk so far and not find a decent old building, and when you do find one it has to get a mention before it disappears. There is good news, as it was hard to drill down for data some years back, but the online resources have been made more accessible (but there seems to be less data than when it was in plain text databases – maybe I’m missing something obvious in front of my nose), and more importantly, having lain fallow for many years with old, out of date data, now seem to be better maintained. This old British Linen Bank building still survives on Gorbals Street and Bedford Lane, and given its dereliction, still looks pretty good. Apparently this is the last remaining Gorbals tenement, which had the bank on its ground floor. The boarded area to the left of the boarded close entrance in the centre was a ground floor shop. Here’s a (bad) pic showing the carving still present over the bank entrance. I don’t why this pic is so bad, I really ‘missed’. This remains a Building at Risk with the last entry at the time of writing being 2015 when £345,000 was awarded for essential repair work.